EFM members start like you and me. They often end up as people making great things happen. Here are big ideas, some of which started as Master Class (MC) projects. Amanda Meecham (MC45) volunteered at the Hamilton Native Plant Nursery for six years supporting its work to establish and maintain native plants in the restored wetlands. The nature based adaptations employed in the Hamilton wetlands provide habitat for migratory shorebirds, waterfowl, fish, and other wildlife. In addition to wildlife benefits tidal wetlands dampen storm surges, prevent tidal erosion, and sequester greenhouse gases. When she heard that funding for the nursery operations was due to expire in two years she determined that unless steps were taken the nursery’s restorative work in the wetlands and education program would also end. 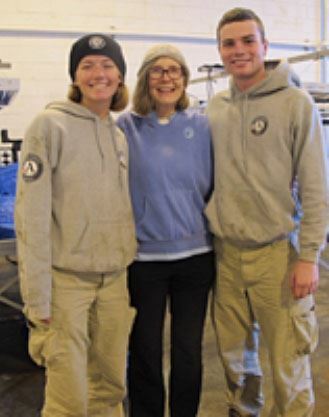 For her Master Class project she joined with classmate Barbra Ball to conduct a feasibility study of ways to continue the stewardship efforts of the nursery. They investigated the many aspects of the nursery’s programs, jurisdictions of different organizations currently involved with the wetland, and potential avenues for securing funding for continuation of the nursery operations. Amanda is currently securing fiscal sponsorship for a startup with the intent of establishing a 501(c)3 non-profit organization to carry on the wetland habitat restoration and education programs at the Hamilton Native Plant Nursery. Marin County is a leader in ecologically sound Integrated Pest Management (IPM). Kraemer Winslow, a Master Class graduate, is once again the appointed chair of the IPM Commission. Former Environmental Forum Master Class graduates were recognized for their efforts as members of the IPM Commission by the Board of Supervisor's at their March 13, 2018. The 2017 Integrated Pest Management Report was accepted. Rika Gopinath, Barbara Bogard and Mary Fraser undertook student projects including initial advocacy to the City of San Rafael and the County Board of Supervisors to establish an IPM Program for City and County Parks and Public Spaces and advocating for non-chemical IPM alternatives in local parks and elementary schools. Barbara Bogard, IPM Core Team Member, worked on the design and implementation of the Yard Smart Campaign, educating the community at large about alternatives to chemical pest management during the last two years. Mary Fraser targeted use of glyphosate advocating for chemical free management in Parks and Public Spaces. In 2017 Marin County Parks successfully managed 126 sites without pesticides, and conventional pesticide use decreased 86% over the previous year. 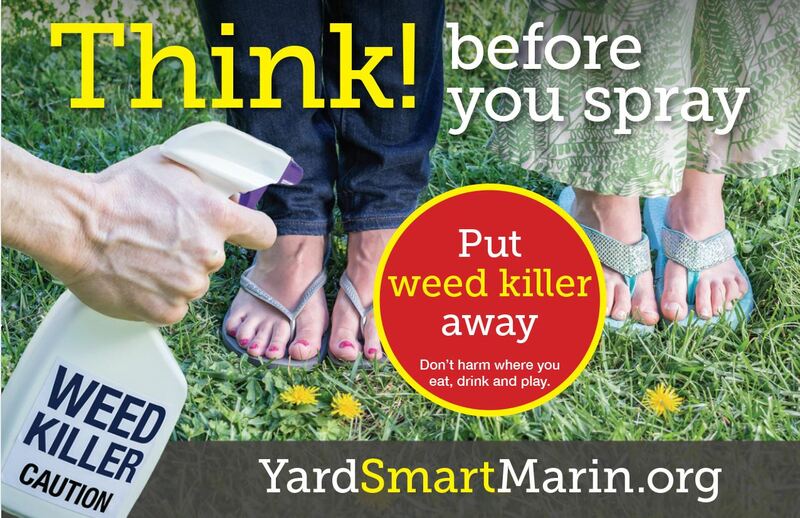 Marin County uses zero glyphosate and zero rodenticide across all 147 sites governed by the County's IPM Ordinance. County Staff oversee a cadre of volunteers and community partners who collectively contribute almost 9,500 labor hours per year to the IPM Program. 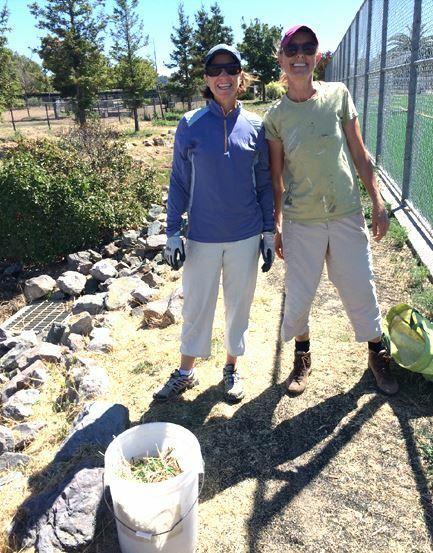 Betsy Clark, Alan Jones, and Kathi deFremery, MC43 spearheaded an ambitious study of the Larkspur Marsh which resulted in a detailed report and was presented to the city of Larkspur in hopes that they assume stewardship of this valuable resource. As their report outlines, marsh resiliency is an important part of mitigating sea level rise. Marshes also filter pollutants, provide important habitat and sequester carbon. The Piper Park Marsh Resiliency effort looks to the Forum membership for help in it's continuation. If you would like to be involved, contact Betsy Clark. Mary Morgan, MC 40, understood the critical role of watersheds and had to learn how to communicate the need for creek restoration at Green Gulch Farm. In 2012, she developed a presentation to articulate the importance of creek restoration and presented it not only to her fellow Master Class participants but also to a variety of audiences including donors and government agencies. 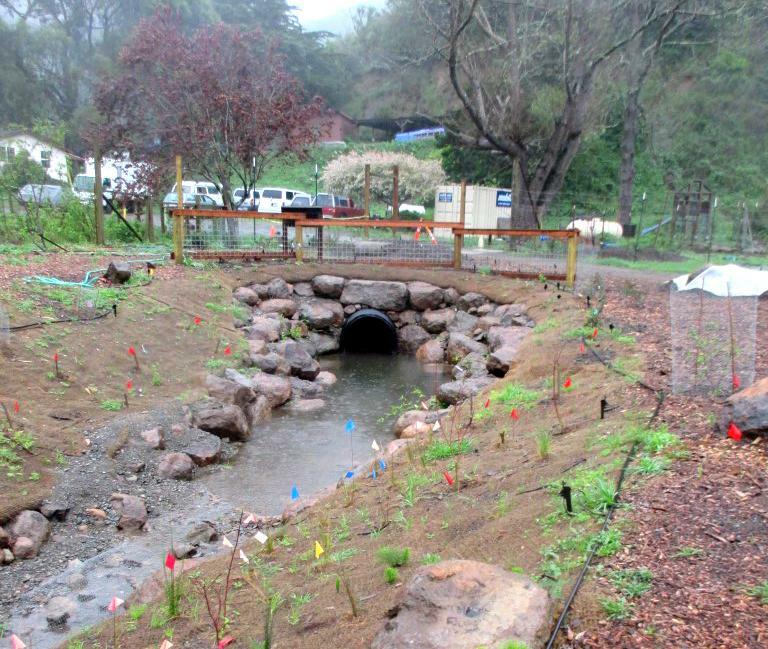 The efforts of Mary, Prunuske Chatham, Inc., and many others at the Zen Center, bore fruit in 2014 when the creek was set free. Both wetland and riparian habitat were created, as well as improved creek habitat critical for the coho salmon and steelhead trout. Today the meandering waterway is once again a habitat that these fish can call home. Mary credits EFM and the rigor of the project process with helping her articulate her points so that she could persuade her audiences and gain support for this project. In 2017, Kurt Johnson's MC44 student advocacy speech proposed the electrification of Marin’s public transportation system. The idea seeded a regional effort: involving 11 cities and town’s and a cadre of environmental organizations (Drive Clean Marin); to advocate that the Transportation Authority of Marin (TAM), which includes local jurisdictions and the Board of Supervisors, adopt policies to reduce green house gas emissions and provide dedicated funding for the acceleration of private and public electric vehicle use through out the County. The Master Class project mentor and four students, participated in the collaborative advocacy effort. The result was every city and town requesting that the TAM Board adopt the proposed recommendation and dedicate funds for that purpose in it’s budget expenditure plan. Dedicated funding of $1.3 million, over the next 3 years, was allocated by TAM for programs: to assess impacts of sea level rise (SLR) on transportation; installation of public charging stations to accelerate use of electric vehicles (EV,s); and to facilitate community education about EV’s ability to significantly reduce green house gasses, save them money and keep oil in the ground. 2019 update: Kurt Johnson (MC 44) and Chair of San Anselmo's Sustainability Commission, drafted an EV strategy which was unanimously approved by the San Anselmo Town Council in February. The strategy includes increasing the number of public stations, electrifying the town's fleet and raising awareness of electric vehicles. History Made: Marin County is the first in California to have all its municipal electricity accounts powered by 100% renewable energy! Helene Marsh and Sarah Loughran, MC 43 (Master Class 43 graduates), applied their advocacy skills to encourage the County and seven Marin municipalities to purchase their electricity through the Deep Green program offered by MCE, which ensures that all electricity is generated by renewable energy sources. They have been successful in persuading Larkspur, Corte Madera, Novato, San Rafael, Ross, Mill Valley, Tiburon and most notably Marin County to commit to Deep Green resulting in an estimated 3,900 metric tons of greenhouse gas emissions to be taken out of the atmosphere annually - roughly equivalent to taking 835 passenger cars off the road. San Francisco Bay Area, What Might have been? What if Marincello had been built? Victoria Bogdan (MC 40) donated her fabulous collection of 10 paintings by the artist Alfred Twu to EFM. 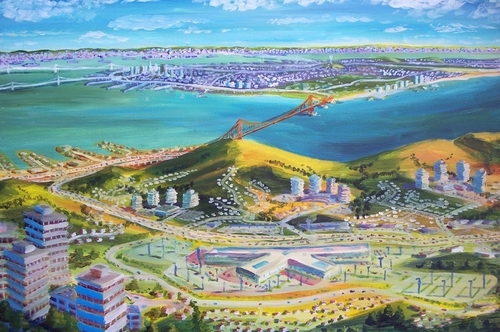 She commissioned the work for her Master Class Project to increase awareness: SF Bay Area, What might have been? Melinda Stone, Master Class 41 graduate, saw her Master Class project through to fruition in the summer of 2017. Her plan was to get The University of San Francisco to buy the 100-acre Star Route Farm in Bolinas to ensure it's future as a farm. Melinda wrote: "The (master) class was instrumental in shaping my proposal and connecting with people that made the project come to fruition". Read more about the purchase in the SF Chronicle and Marin IJ. See more Members' impacts from Straws Upon Request to school bus programs. It started here.